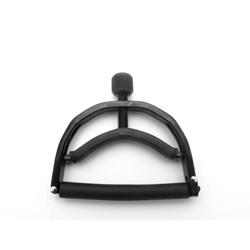 Width 1 7/16, Open Depth 1 1/8, Closed Depth 3/4) A sleekly designed, controlled tension capo for the banjo or mandolin. Fits to the 4th fret on a 5-string banjo. Paige, a name musician's can trust! Paige capos are designed for controlled tension with no buzzing or muting. These capos move quickly and easily. Made in the USA, this Paige capo is designed specifically for a banjo or mandolin. Stores easily behind the nut when not in use.